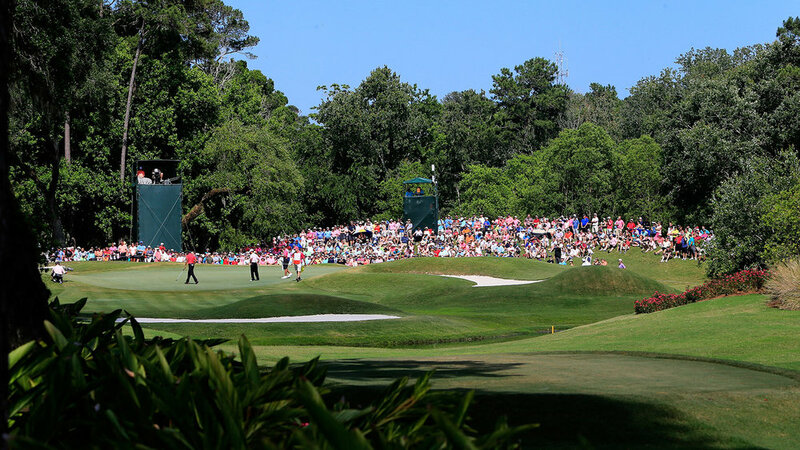 A new trophy, "the biggest prize professional golf has ever seen for a single tournament"and one of the strongest fields in golf all take centre stage this week for The Players Championship at TPC Sawgrass. 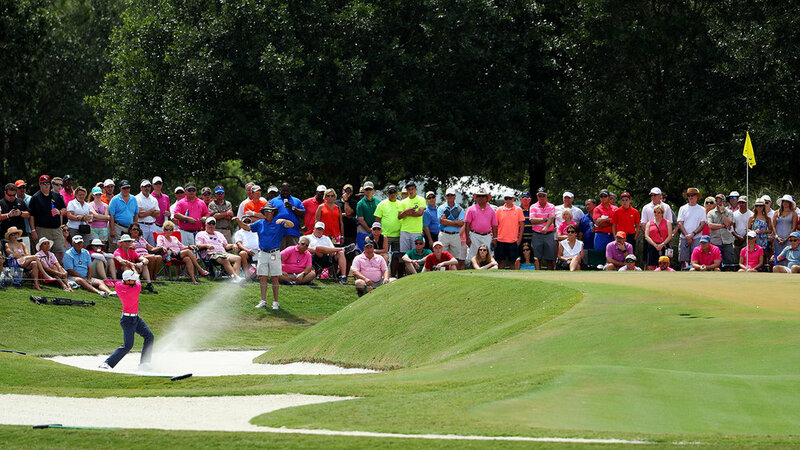 Along with a host of tweaks to the PGA Tour schedule for 2019, the tournament – commonly called ‘the unofficial fifth major’ –has been moved back from May to March for the first time since 2006. 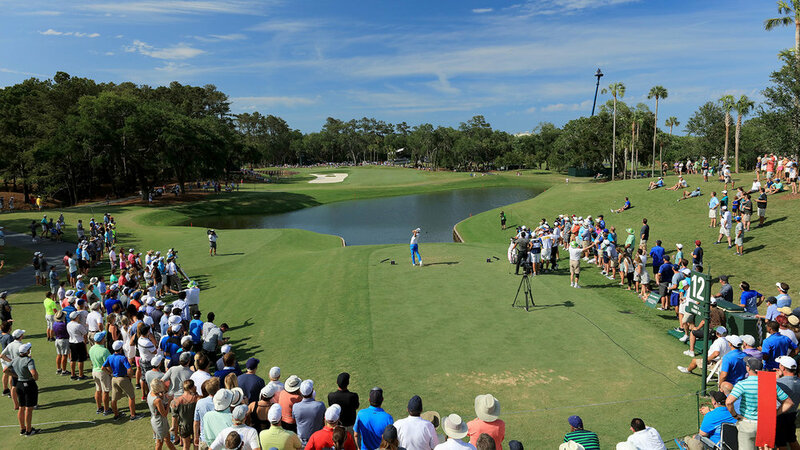 Last year marked the second staging of the new-look TPC Sawgrass, which saw an extensive transformation following Jason Day’s victory in 2016 that included resurfaced greens, new bunkers and new water hazards, in addition to the risk/reward 12th hole which came under fire in 2017. And despite headlines centering around a battle for World No.1 and Tiger's return, it was a dominant Webb Simpson who took home the spoils at 18-under-par. Simpson posted rounds of 66, 63, 68 and 73 on his way to his fifth PGA Tour title, which included a double bogey on the last to finish four clear of the trio of Xander Schauffele, Charl Schwartzel and Jimmy Walker. He was the eighth wire-to-wire winner at Sawgrass. See below for a hole by hole guide, plus some fascinating facts and stats about the infamous island green 17th hole. Webb Simpson tied the tournament records for low 18-, 36- and 54- hole scores en route to winning his fifth PGA Tour title at The Players Championship. Simpson, who won by four strokes at 18-under, claimed the victory in his 250th career start at the age of 32 years, 9 months, 5 days. In a six-way tie for first place at the end of the first round, Simpson fired a second-round 63 to tie the course record and the low 36-hole score in Players history (15-under 129; tied Jason Day/2016). In addition, Simpson opened the larg­est 36-hole lead in tournament history (5 strokes; previous: 4, Jason Day/2016). With a score of 19-under 197 and a lead of seven strokes through three rounds, Webb Simpson tied the low 54-hole score (Greg Norman/1994) and held the largest 54-hole lead in tournament history (previous: 5 strokes, Alex Cejka/2009). 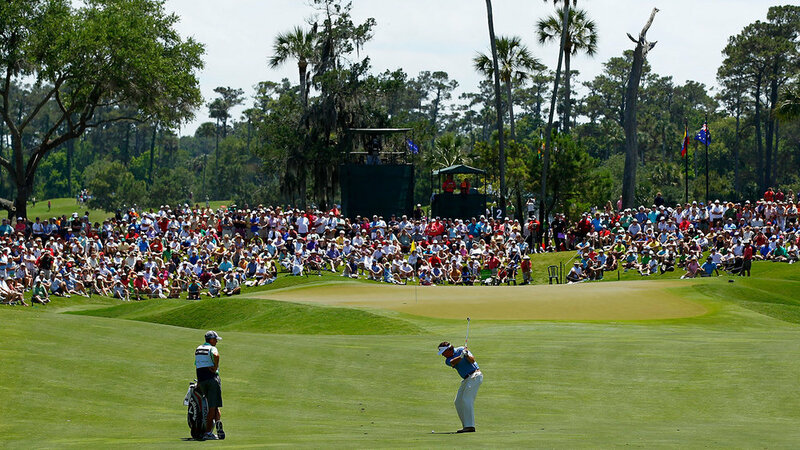 Simpson’s final-round 73 tied David Duval’s in 1999 for the high finish by a winner at TPC Sawgrass. For the week, Simpson led the field in driv­ing accuracy percentage (46/56, 82.1%), becoming the second winner of The Players to do so. 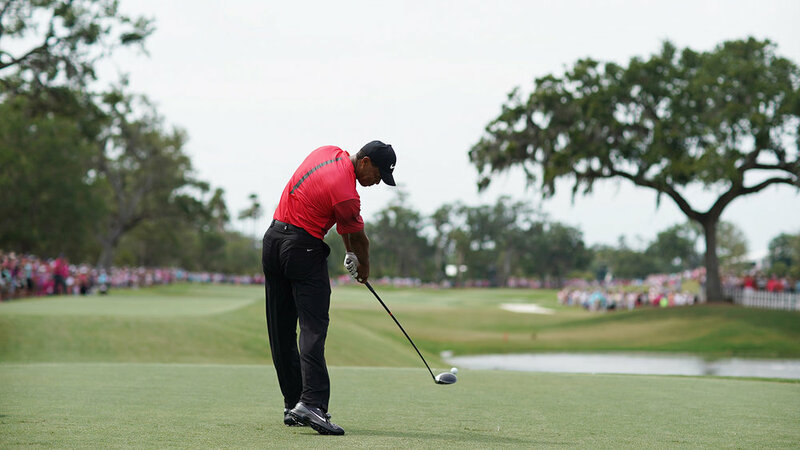 His 46 fairways hit were the most by a champion since Fred Funk hit 48 in 2005. Simpson also ranked last (71st) in driving distance (280.5 yards). In the final round, Brooks Koepka made a 2 at the par-5 16th (6-iron) 208 yards) for the fourth albatross in tournament history and second at No. 16 (Rafa Cabrera Bello/2017/R4). With a 63, Koepka recorded the low final-round score (previ­ously: 64/twice - Fred Couples/1996, Davis Love III/2003) and tied the low 18-hole score (eighth instance; most recent: Simpson/2018/R2) in Players history. This fairly gentle opening hole with a touch of dogleg right about it, with a gaping, gleaming white bunker stretching down the right side. The fairway is fairly generous, but it still requires a precise tee shot; and drives favoring the right improving the angle into the long, narrow green. Expect players to hit a long iron, hybrid or 3-wood off the first – a long fairway bunker, a lateral water hazard and grass bunkers await errant drives to the right, while dense trees guard the fairway to the left. As this is a medium-length par 4, the emphasis is again on accuracy for the second shot. Large maintained bunkers protect the front and left portions of the green. Grass bunkers in the front right, right and rear areas of the green protect the remainder of it. The first par-5 at TPC Sawgrass comes early, and it’s very reachable for most of the field – playing half-a-shot under par last year, even though long, narrow the green isn’t the easiest to hit. Oak and pine trees along the right pinch the landing area, with the second shot (if they’re going for it) played across a narrow lake and a strip of sand (which finishes well short of the green so it isn’t really in play). If a player hits it too far left off the tee, they might be blocked out by the pines; there’s also swathes of rough down the left. If they do find the fairway, though, it’s a fairly standard approach. There are some deep pot bunkers to try and avoid on both sides of the green, and the swales around the green are mown tight, but anyone walking off here with a par will feel a little disappointed. A fairly standard mid-iron for most of the field, to a big green with not many issues – traditionally it’s been one of the easiest par 3s. Most players will just aim for the middle of the 30-yard-deep green and take a birdie putt. The danger is mainly on the left, where numerous run-offs call for short game imagination. There’s also a deep bunker back left that’s a good six to eight feet below the level of the green. 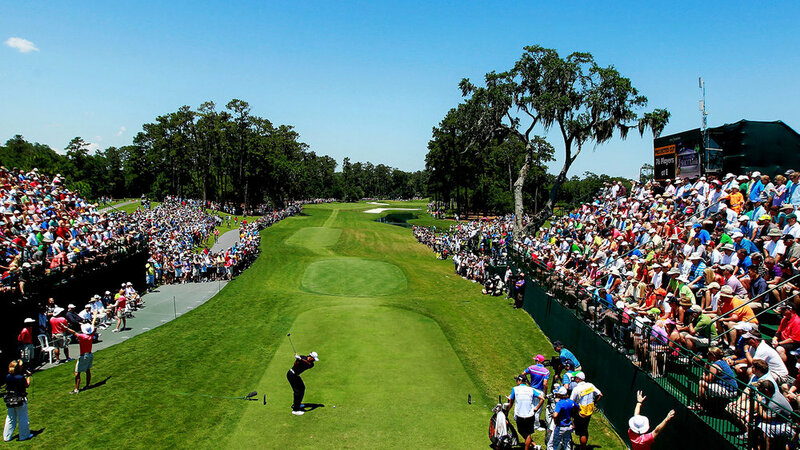 Even so, there will probably will be more birdies here than on the other par-3 holes at TPC Sawgrass. The Stadium Course’s longest par 4, and the hardest hole on the front nine, which regularly plays over par. It’s a subtle dogleg right, and off the tee the thing that catches your eye is the cavernous bunker down the right – which is ideally the side you want to come in from. Many players would probably favour the sand right rather than the hanging lie in the rough they’ll find on the left. The big green is protected by tightly-mown swales, bunkers, bunkers, a waste area and palm trees. This is one of those holes where players will be happy to walk off with a par. Pete Dye once called it the most beautiful hole on the course, and even though it’s relatively short, it’s fraught with danger. There’s a huge bunker down most of the left side (and water if you’re REALLY wayward! ), and that’s replaced by a cluster of palm trees. Left isn’t much better – it’s wild brush just off the cart path. The slightly elevated green is protected by more palms, a handful of bunkers and swales. The two-tier green slopes from right to left and back to front. Off the tee your eye is drawn to the sliver of sand all the way down the left, and the water left of that. Miss right and as well as juicy rough, there are three small traps that act as a magnet for balls. The smallish green runs away from the player with a sharp drop at the back. The green is protected by two tiny bunkers front and left, and a severe slope off the back. In 2017, the water down the left was expanded, making it much more visually intimidating for players. The tee was also shifted five yards to the right, bringing the overhanging trees on the right into play and making a fade the preferred ball-flight. The longest par 3 on the course requires a long iron or fairway wood to carry into the middle of the green, avoiding 10 bunkers and severe drop-offs around the green. It will test many a player’s short game, especially with some of the tighter pin positions. The final hole on the front nine is a good birdie chance for much of the field. The landing area for the tee shot is wide and flat… problems start with the approach if players play to go for it in two (it’s much easier if they knock a mid-iron and a wedge on). Oaks, pines and palms come into play down on the second shot, particularly down the left; you can easily catch an overhanging branch and find yourself stuck in the long trap that hugs the approach. The green is very thin and severely sloped from the front to the back right. A severely banked bunker guards the left and rear of the green, along with three tiny pots. A dogleg par 4, with a large bunker down the left side of the fairway and very dense trees to the right. Again, the narrow landing area for the drive demands accuracy. Most players will select a fairway wood from the tee to set up a middle or short iron approach to the green, which is protected by two maintained bunkers in the front right. Grassy mounds crowd the entire left side. From the landing area the green appears to be very large; actually, it is narrow and fades away from the players. This green offers a variety of pin placements, making the position of the drive very important. It should be a fairly straightforward par 5, but like so many holes at TPC Sawgrass, it’s not as simple as it looks! It’s reachable for much of the field, but a line up the left is preferable and means players are hitting their seconds away from the water in front of the green. A large tree down the right will cause problem, though, it players are too far right. A large bunker runs the length of the second shot landing area and continues up and around the green, as down the pond. There are two tiny pot bunkers left of the green, along with a large area of fairway where, if we’re honest, most players would be happy to end up after two shots. The 12th was redesigned before the 2017 tournament into a risk/reward, driveable par-4 with water down the left. It was tweaked a little last year, but fundamentally remains the same. Players stepping on the tee have a simple decision – go for it with a driver or fairway, or hit a mid-iron and a wedge. The latter is the safer option, but when tour players have a drivable par 4, they find it hard to resist! A large fairway bunker stretches the length of the left side of the fairway and forces an accurate shot off the tee for those that do not attempt to drive the green. Fifty yards of fairway lies between the end of the fairway bunker and the green, but the ground slopes severely from right to left, towards the water. The green has several tiers, and slopes dramatically toward the water. Even so, whatever they choose to hit, most players will expect to birdie the 12th. This fairly innocuous par 3’s biggest defence is the green, which has some big slopes down to the water. Three tiers demand precise tee shots; and left-hand flag locations to bring the water into play; the highest part of the green is the right front quarter; the right rear quarter is just slightly lower and slopes away from the tee; the entire left side slopes drastically toward the water. A long, tough hole, with water and sand all the way down the left, and rough-covered mounds down the right. The green is enormous by Stadium Course standards and has plenty of slopes. A bunker protects the front left side of the green and a few other bunkers hide among large swales to the right and the rear of the green. A very reachable par 5, as proved by Brooks Koepka last year when he made an albatross here. The first challenge is to draw one off the tee, so it bends round the corner and bounds down the fairway. If a player does that, he has a great chance of getting home in two. It’s still a tricky approach though, with water all the way down he right and a troublesome lone tree on the left that can block you out if you’re forced to lay up from the rough. The green has two tiers, sloping left to right towards the water that wraps around the rear of the green. The swales to on the left side of the green are a popular (and safe!) landing area. The most famous par 3 in golf? With the 12th and 16th at Augusta, it’s certainly a contender. Some players love it, others despise it, but there’s no getting away from these 137 yards across the pond… everyone has to face it. If the water wasn’t there, it would be a really simple par 3. But it is there – and it looms large in front of 150,000 whooping spectators… If you hit the middle of the green and two putt for par, it’s a doddle. But if you over-hit it, or misjudge the wind, or catch it just a little fat… you can either reload on the tee and risk doing the same, or take the walk of shame to the drop zone, where it’s not much easier to hit the green. Club selection on this hole is critically important; with the tricky winds of spring, the Championship could be won or lost here. In the last 15 years, the field is a combined 762 over par on the 17th. Between 2003-2017, 703 wound up in the water. Bob Tway hit in during the wind-swept third round in 2005 en-route to making a 12, the highest score on the hole in its history. Has anyone birdied the 17th in all four rounds? Yes! Once… by Paul Azinger in 1987. The longest putt on the 17th was 59 feet, 9 inches, made by Bernhard Langer during the second round of the 2008 tournament. Tiger Woods’ 60-footer putt in 2001 was from the fringe so, technically, under PGA Tour rules, doesn’t count as a putt. Langer has made the most career birdies on 17, with 24. Hal Sutton is next with 19.